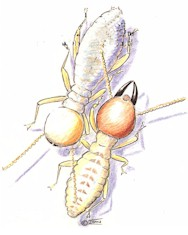 In nature, termites have an important role in recycling rotten timber in the forest and returning nutrients to the soil. When they get into our homes they are then declared pests and the damage they can cause to a home is substantial. 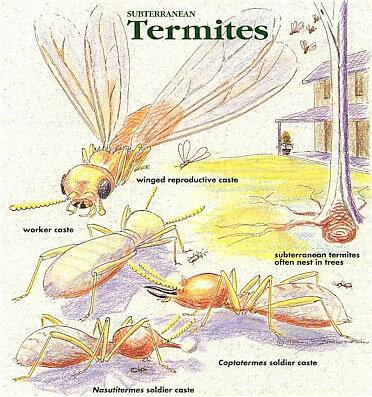 Termites are social insects and have a caste structure which differentiates workers from soldiers and reproductives. Termites can travel long distances to find food. The nest may be fifty metres away from where the workers are foraging. They can work their way into a house from under the floor, up the wall cavity, alongside plumbing penetrations or through construction joints in the concrete. The first stage of any pest management program is inspection. This should be carried out by an experienced technician. The inspection will determine the extent of the infestation, if present, identification of the termite species, where the termites are entering the building and also what steps need to be carried out to eradicate any termites present and protect the building from further attack. Eradication of any existing termite infestation is important to stop the damage spreading. This is usually done by applying an insecticidal dust to the active workings. The termites then take this back to their nest and as they groom themselves, pass it through the nest. Once this is done, the nest will quickly die off. If the nest can be located by the technician it may be physically destroyed by breaking it up or an insecticide can be applied to the nest, killing it directly. Once the nest is eradicated, any termites remaining in infested timbers should die out quickly. However, the home is not protected against re-infestation especially if other nests are located nearby. The best protection your home can have is a barrier system to impede and discourage the concealed entry of termites into your home. For termite management, there are Australian Standards – AS3660.1 – 2000 sets out requirements for termite management for new buildings Chemical barrier systems should be installed by a licensed pest control operator using approved termiticides. With new homes built on concrete slabs, the slab may form part of a termite barrier system if it is constructed to AS 2870.1. However, the termites can still come around the outside edge of the slab. AS 3660.2-2000 specifies the requirements for perimeter protection. The Standard also stresses the necessity for regular, competent inspection of termite barrier systems. As a home owner or builder, there are many things that you can do to reduce the risk of termite attack to your home. These include removing all loose construction timbers from around and under the house. Don’t stack timber or firewood next to or under the house. Ensure that ventilation is adequate beneath suspended floors as if the soil is dry, termites will not be attracted to this area. Ensure you have a termite inspection carried out by an experienced technician at least every twelve months.